You first came into the public gaze when you spent a few months in UFO after Larry Wallis left. Then it was off to Wild Turkey. What were you up to before then, and why did you only pass through UFO briefly? Bernie Marsden: I had been playing with my local band, Skinny Cat. I had been to quite a few auditions before UFO, managed to get the gig and then not want to do it! UFO were signed to Chrysalis, they were a happening young label at the time, management, agency, and recording, it seemed the right move at the time. Mercenary I suppose in retrospect, we both knew the tenure would not be long! But I was the person that first saw a 16 year old Michael Schenker with his Flying V, and said that he should be in the band, its all a long time ago now, I have a lot of respect for the UFO time because it elevated me from semi pro to the big league, and I will always be grateful for that. Wild Turkey put out a couple of albums on Chrysalis which didn’t really go anywhere, although I have a soft spot for "Battle Hymns". Did they just get lost in the rush of acts vying for attention at the time? Bernie Marsden: To be honest I have no idea, both those albums were recorded before I joined the band, it was so different to UFO, we were gonna be the British Allman Brothers, check out the rare BBC stuff and a couple of bootleg albums, great stuff. Then it was off to Babe Ruth. Did you think that was going to be the big break? They were fairly established and had just had a chart album in the USA. 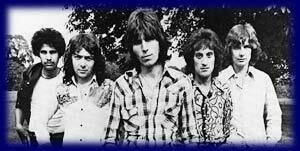 Bernie Marsden: Actually it was off to Cozy Powell’s new band Hammer! I had worked with Cozy many times with WT when he had Bedlam together, suddenly he was on Top Of The Pops, and had a number one single, bizarre. Even more bizarre I was with him on the very show a few weeks later with Don Airey on keys, playing "Man In Black" Great band with Clive Chaman on bass, Frank Aiello singing. We toured with Suzi Quatro, "Rak Rocks Britain" It didn’t. Another story! I was mildly horrified that some of your erstwhile colleagues ended up in dreadful disco outfit Liquid Gold who had a massive hit with "Dance Yourself Dizzy". Fortunately for all concerned you got a call from the ex Deep Purple duo of Jon Lord & Ian Paice. How did that come about? Bernie Marsden: I don’t think that I was ever in the frame for the LG gig!! The call from the Purple boys was while I was still in Babe Ruth. Cozy Powell had recommended me for the gig. Objectivity out of the window. I love "Malice in Wonderland" by Paice, Ashton & Lord! Looking back, how do you feel about it now? PAL barely got out of the starting gates, but then another former Deep Purple man came calling. It must have been nice, being so highly regarded? Bernie Marsden: It is always nice to be asked, David was very gracious, at the time I was awaiting conformation of the gig with Wings, but after our first get together with Micky Moody I knew that this would be a special band, playing real rock blues, I wanted in! At the time it seemed to be still a David Coverdale solo gig. How did the metamorphosis into a 'proper' band come about? Bernie Marsden: To be fair to David, he always wanted the "band" thing to be first on the posters, we travelled in the same van as the gear at first, happy days! 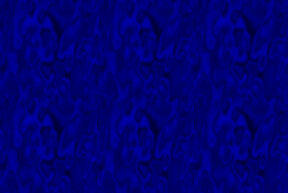 But things change, the band became more and more successful and I look back opn those early days with great affection. Of course, it was also the start of a long musical partnership with a certain Micky Moody. 28 years and counting! What keeps the two of you coming back for more? Bernie Marsden: Micky and I have been friends for a very long time, before Whitesnake, in fact I almost joined Juicy Lucy before UFO. We are a bit like Crosby and Nash I guess, we can work together and travel together but we don’t live one another’s life. Plus the fact that I love his playing, always have. For me, from 1978 - 1981, Whitesnake were the finest live act treading the boards. Flattery aside, why was it such a potent blues / soul / rock combo? Bernie Marsden: Thanks, I agree! The band were always looking for the next great song, I wish we still had some record of songs we scrapped, the early days were good, but once Ian and Jon were in the band just became a monster. There is a film of the classic line up somewhere, I would like to see that one day, just to make sure we were that good! You also found time to record a couple of solo albums, both released in 1981, with an all star cast. Was that frustration with the day job, or too good an opportunity to miss? Bernie Marsden: Certainly not frustration, David was very active with "About Time Too" we recorded demos at his house, and he wrote lyrics for half of the songs. When you can call the likes of JL, IP, CP, or Don Airey, well you just do it. Simon Phillips played drums as well on the second album, I think more drummers bought it than guitar players! (both of Bernie's solo albums are available on Purple Records). Then it all fell apart for Whitesnake. If you feel like telling the tale again, what went wrong? Bernie Marsden: It is well documented already, I really hoped that the line up of Whitesnake after myself and Paicey and Neil should have been spectacular, it wasn’t and that was a double disappointment to me personally, the later line up with John Sykes was terrific though. Next up was SOS which subsequently, became Alaska. To be brutal I didn’t care for "Heart of the Storm" or "The Pack". It was a bit too shiny and squeaky clean, although the one live show I caught in London was infinitely better. How does that period look to you now? Bernie Marsden: Be brutal, I think the albums still sound good, I was conscious of the songs being melodic, but you are right in the fact that the live show was a lot tougher. After the short lived MGM you seemed to disappear off the radar for a few years. What were you up to? Bernie Marsden: In fact I was very active, I worked in Los Angeles on a film soundtrack, "Runaway Dreams" wrote the score and became a film music person. I worked with Andy Taylor from Duran, his solo album has never seen the light, we wrote some great stuff, and we had a song in the MeL Gibson film "Tequila Sunrise. I had two songs in "The Fourth Protocol" and was featured in a BBC TV series with Leslie Grantham called The Paradise Club. The nineties saw a few low key collaborations with Mickey Moody, and your solo album "Green and Blues". Hard times or good times? Bernie Marsden: I wrote an album with Iron Maiden’s Adrian Smith, I hope that gets heard sometime, he is a great guitar player, but his voice is amazing, the Moody Marsden Band was a way of gigging with people I wanted too, MGM was a disaster, but the tapes are really good, Bobby Kimball, the moment he sings it’s Toto, and I was fan number 2 of Toto from day one, number one being the late Mr Powell who came to London to play the first Toto album on my system, Cozy was such a music fan. Going back to "Green and Blues". The cover notes have a lengthy appreciation. But to the unitiated amongst our readers, what was it about Peter Green that was so inspirational? Bernie Marsden: Peter was the guitar player that I always wanted to hear, never to emulate, I loved Eric Clapton and Jeff Beck, Hendrix of course, but Peter Green just hit the parts that the others didn’t, and I always thought his song writing was special, listen to "The Same Way" on Mayall’s "Hard Road" The signs of what was coming are there. When I wrote those sleeve notes I didn’t know where he was, just before the CD came out he rang me up, "I’m not lost, I’m in Surrey" I see him quite a lot these days. Then the noughties, and a deal with SPV for The Company of Snakes with Mickey Moody and Neil Murray. 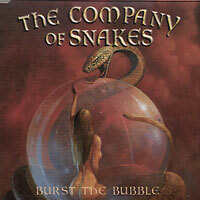 Like many, I doubted the wisdom of a double live album of old Whitesnake songs, but "Burst the Bubble" came as an absolute delight. Did you think that was going to be the one to put you back on the map? Bernie Marsden: I don’t think you ever presume to be "back" although I did feel that BTB was a very good album, to be back you have to go away, and we are always around it seems! What happened to bring about the end of Company of Snakes and the arrival of M3? Bernie Marsden: TCOS had been gigging for about a year, nice gigs, but when we played the Whitesnake stuff the audience volume would go up 70%, we toured Russia and Scandinavia with Alice Cooper, and a gig in Helsinki summed the problem up, halfway into "Shadow of the Blues" the 7000 crowd realised it was the original guys from Whitesnake, the papers the next day said that Whitesnake played a secret reformed gig, the following day TCOS played a gig in a small Finnish town, about 100 people showed up, all Whitesnake fans. I talked to Micky and Neil, and we decided to give the people what they really wanted. M3 saw another pile of touring, another live album of Whitesnake songs, and ex Black Sabbath singer Tony Martin. Anything you want to say in public about that parting of the ways? Bernie Marsden: The gigs were fine, a full tour of Russia and some dates in Denmark, and the UK, another live album and then another singer! M3 is about the music of Whitesnake, no more, no less. Of course, Tony Martin is now doing the Whole Lotta Metal karaoke type tours. I take it you won't be popping along to one of the shows? Bernie Marsden: Don’t think so, never was any good at karaoke, some people are though. Now it's time for your first DVD, and M3 seem to be more visible in the UK. What keeps you going after more than 30 years in music? 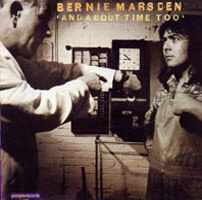 Bernie Marsden: When you are 30, you don’t think it will go on much longer, same at 40, and here we are still doing it. The DVD is a great opportunity to put this music in visual form for the first time, I really believe that Micky and I are playing much better today than at any time in our careers, Neil Murray is without doubt the greatest rock bass player, and with Jimmy Copley on drums the songs are on fire. Add Mark Stanway on keys from Magnum, and not one but two vocalists in Doogie White and Stefan Berrggren singing from the heart, understanding the songs, and giving the vocals the respect they deserve. We have a DVD that we are truly proud of. M3 will be on the road at the end of the year in the UK, check out the DVD and enjoy your music, whatever it may be. M3 are to release a live DVD called 'Rough An' Ready - Performing Classic Whitesnake' on May 30. Released by Classic Pictures, it features the band, including former Whitesnake members Micky Moody, Bernie Marsden and Neil Murray playing classics like 'Here Go Again', 'Trouble', 'Ready An' Willing', 'Ain't No Love In The Heart Of The City', 'Walking In The Shadow Of The Blues' and 'Fool For Your Loving'. Thanks to Ben for arranging the interview, and to Bernie Marsden for so many great songs and memories.